As I just mentioned, there was a big security brouhaha on the ferry this morning, which delayed it for at least 30 minutes: some bicycle passenger forgot how he boarded on the other end and left his bike behind. Apparently that triggered worries that the bike might literally be a pipe bomb (cue a punk band), and one set to blow up if anyone attempted to move the bike at that. At the last minute, I decided to grab my ham radio HT on the way out the door, so I was able to listen to some of the chatter about it (they never ‘fessed up to all the fuss being over a forgotten bicycle on the PA system’s announcements, of course). Lingering fog at about 9:15 AM today. One of the things I’ve grown to expect in the Puget Sound region is how, starting sometime in mid- to late- September, the mornings start getting foggy. Even though it’s not consistently rainy yet, those colder, foggy mornings are a sign the seasons are turning. 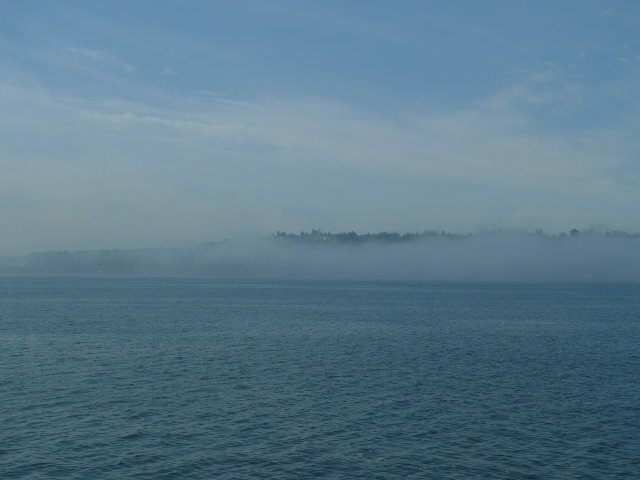 Since moving to Bainbridge Island, I’ve learned that the fogs actually start in late July over the Sound (at least, they did this year), and gradually build in intensity as the nights lengthen. It’s apparently only until September that they’re widespread enough (and expanded enough in scope from their origin over the Sound) that they become apparent to those on land. It was another morning of waking to ship horns today. Tendrils of mist were wafting through the apartment courtyard. The island beaches were completely socked-in. A security brouhaha delayed the ferry today, so I’m still in Eagle Harbor at the moment. The fog dissipated over the past half-hour here, but you can see it’s still completely socked-in further out over the Sound. I don’t normally link to real-estate listings, but what was done to this property was so awful that I simply must. Some flippers took what must have been a classic 1960s A-frame and basically ruined it, aesthetic-wise. It’s pretty much a textbook case of everything evil about flippers. They tend to be investors bereft of any sort of artistic, historical, or aesthetic sense save for pandering to the most banal of whatever design fads are presently prevailing. They renovate properties which indeed are often worn and neglected, but without any consideration for the design elements that make them unique and give them character. The result, as with this property, is all too often something which can never again easily possess the many of the design characteristics which once gave it defining character. Take that A-frame for example; it once had natural wood finishes as its defining element. Now every such surface has been painted over in a faddish color scheme. It would take a lot of money and effort to remove all that off-white awfulness. So it will probably never be done. What was a major defining design element of an A-frame is now gone, forever. It’s so sad. That house could have been just as easily been cleaned up and restored into a really great “back to the sixties” vintage home (with a few tasteful modern updates thrown in here and there, of course; nobody’s saying a cheap, unreliable 1960s range in the kitchen must stay). That would have created something truly unique and full of character that simply cannot be purchased in a new home. Instead, we have a house trying to be something other than what it really is, and failing miserably. Despite that, it will probably sell just fine. Part of the problem with remodeling is that such tasteless hatchet jobs tend to look just fine to all-too-many eyes… when they’re first done. The widespread regret only starts kicking in a decade or two later. Witness all the owners of classic Victorian homes who eagerly paid good money to have them “modernized” by covering their clapboards with (link) T1-11 siding and removing so-called “excessive” ornamentation back in the 1970s. Here’s one example of what can be done with a vintage A-frame. (No, I don’t think it’s perfect, but then again I’d expect to have some design quibbles with someone else’s vision. No two people can ever be expected to agree 100% on matters of aesthetics.) The contrast between this LA artist’s vision and the local one of a 1-dimensional person whose vision is limited to turning a quick buck is, shall we say, fairly striking. Update: Here’s what it looked like before the flippers vandalized it. It wasn’t completely intact by the time they got it (not a surprise, it is 50 years old), but it did still have all the basic fundamentals a home of that style should have. It would have made a great starting point for a tasteful renovation, and it sold for 164 grand less than the current asking price.